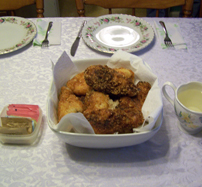 This recipe I created because I didn’t like the breading on most southern-fried chicken recipes. I like a little crisper texture to my fried chicken. I think this one is a winner! People love this chicken and it is so tender inside with the right amount of crispness outside, it’s just delicious! Yall come to supper! First we need to set up your breading station: You will need 3 shallow pans or pie plates to bread chicken. In the first pan put 2 cups flour. In the second plate pour in the buttermilk, and the 3rd plate mix together 1 cup of flour with 2 cups potato flakes, salt and pepper. Wash chicken and then roll chicken in the plate of self rising flour. Then put chicken in buttermilk. Turn chicken to get both sides in the milk. This creates the glue for the last breading stage. Then roll chicken in potato mixture. Repeat the above steps until all the chicken is breaded. Gently shake off any excess flour and your chicken is ready to fry. Make sure your oil is heated to 360 degrees and place your chicken in to fry. Wait until the first side is lightly browned before turning over. Cook and turn for approximately 15 minutes or until chicken is fully cooked. Serve hot, but this chicken leftovers are great served cold right out of the fridge. * I highly recommend using an electric skillet for frying chicken. The thermostat on the skillet helps keep your oil at the perfect temperature and ensures that you will not burn it. They all loved it. It was crisp outside and tender inside. Yummy! I can’t wait to make this! It sounds yummy!